Be the first to share your favorite memory, photo or story of Dr. Arnold. This memorial page is dedicated for family, friends and future generations to celebrate the life of their loved one. 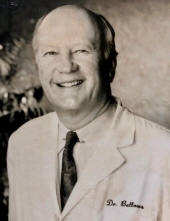 Dr. Arnold Robert “Bob” Bellows, a retired ophthalmologist and glaucoma specialist, died after a long illness on March 15, 2019, at CareDimensions, Hospice House, in Lincoln, MA. He was a recent resident of Lexington, Massachusetts. He also enjoyed a long-held residence in Deer Isle, Maine, and trips to Idaho, Montana, and Wyoming, fly fishing with many friends and colleagues. On May 30, 1964, he married Jean (Farley) Bellows in Nashua, New Hampshire, his devoted wife of 54 years and a trauma psychologist and educator. Throughout their lives they were avid travelers, cooks, and patrons of the arts, in particular holding membership subscriptions to the Boston Symphony Orchestra since 1973. Bob was born on May 14th, 1937, in Manchester, New Hampshire, the only child of the late Arnold Leo Bellows and Eleanora (Chulada) Bellows. Excelling in academics, athletics, and student life, he graduated from Central High School before attending Brown University in Providence, Rhode Island where he studied Psychology and pre-Med, and was a member of the Brown Football team and the Delta Upsilon fraternity. Upon graduation, he was admitted to Boston University Medical School, followed by a two-year residency in internal medicine. In 1965, he and Jean moved to Tripoli, Libya where he served for two years in the US Air Force, and where they travelled extensively throughout the Middle East and Europe. In 1967, Bob and Jean moved to New Haven, Connecticut for Bob’s four-year ophthalmology residency at Yale University, at the end of which they moved to Haiti to work at the L’Hopital Albert Schweitzer for six months, where they would later return to continue their work. Upon returning to the Boston area, Bob completed a glaucoma fellowship at Massachusetts Eye and Ear Infirmary, after which he joined Ophthalmic Consultants of Boston, joining Dr. Buck Fredrick, Dr. Tom Hutchinson, and Dr. Silvo von Pirquet, where he specialized in glaucoma and cataract surgery. During this period, he wrote many scientific articles in a wide variety of peer reviewed journals, and held leadership positions in many national and international ophthalmologic organizations. Bob is survived by his beloved wife, Dr. Jean Bellows; his son, Matthew Bellows and wife Ruth Webb, of Cambridge, Massachusetts; daughter, Khristen Bellows of San Diego, California; son, Nathaniel Bellows, of New York City, New York; 4 grandchildren: Anna, Nelson, Roy, and Kassius; and his devoted dog, Sophie. Family and friends are invited to attend his memorial service on Sunday, March 24th at 12 pm in the Story Chapel at Mount Auburn Cemetery, 580 Mount Auburn Street, Cambridge, MA. A private family burial will precede the service at Mount Auburn Cemetery. In lieu of flowers, donations may be made to the American Glaucoma Society (AGS); Eye Care America (via AAO); L’Hopital Albert Schweitzer. "Email Address" would like to share the life celebration of Dr. Arnold Robert Bellows, MD. Click on the "link" to go to share a favorite memory or leave a condolence message for the family.